This potato fry features frequently in buffets, kalyana saapadu menus and sometimes as part of the lunch thalis served in hotels like Saravana Bhavan. The potatoes are a lovely golden brown, crisp on the outside and coated by a hot and spicy masala mix that is not wet. It’s a lip-smacking stir-fry of pre-boiled and already shallow fried potatoes that goes great with rice and dal and also with poori or vegetable rice. The 2-step frying ensures that the potatoes are crisp and have absorbed all the masala. You can use the same technique with yam (Karna Kezhangu) or raw plaintain (Vaazhakkai) as well. Potatoes are a cook’s delight. You can prepare them in innumerable ways and you can rarely go wrong. They almost always taste great. I love potatoes. My daughter likes them too. For kids, try toning down the spice powders a bit and I am sure they’d love these potatoes just as much as French fries. Sending these to Sowmya’s Crazy for Potatoes event and Pari’s “Only” event. 1. Boil potatoes with their skin on till cooked through but firm. Let cool, peel and cube them. 2. In a non-stick skillet/pan, heat 4 tbsp oil and when hot drop in the cubed potatoes and shallow fry on low till the potatoes turn golden brown around the edges. This might take around 10 to 15 minutes. Fry in batches if they don’t fit the pan. Don’t crowd the pan. Add more oil if necessary. Once done, remove onto absorbent paper. 3. In the same skillet, add 1 tbsp oil and drop in the mustard seeds. When the mustard seeds splutter, add the urad dal and let the dal colour. Drop in curry leaves and fry till they turn crisp. Now add the chopped onions and sauté till they turn translucent. Then pour in the tomato puree and mix well. Add the turmeric powder, chilli powder, coriander powder and salt and mix well. Cook till the oil separates. 4. Now add the fried potatoes to this spice mixture and toss gently to coat. Let cook for about 5 minutes till the potatoes are heated through. Remove from heat and serve hot with rice and dal. 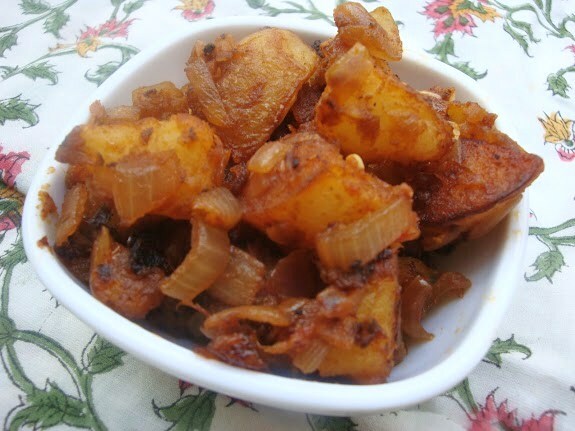 This entry was posted in Sides/Vegetables and tagged buffet style potato fry, dry vegetable, hotel lunch thali, kalyana saapadu style potata fry, lunch thali style potato fry, recipe, side dish, stir fried spicy potatoes. I've been looking for this 'Kalyana veetu potato thokku' for a long time..will try this out 🙂 looks yum ! looks delicious!!! Please add the link to Pari's page.. Thanks for linking it to my event!! Looking for more yummy recipes! !